2 When Canada began expanding West, attention was diverted from what would be her smallest province. After Manitoba joined confederation in 1870, Prince Edward Island rethought her decision not to join. 3 Prince Edward Island, or P.E.I. as she is affectionately known, was originally the territory of the Micmac people. They called the island Abegweit [ah-BEG-wate] which meant "land cradled on the waves." 4 Jacques Cartier described the island as "the most beautiful stretch of land imaginable." Champlain named it St. John's Island in 1603. In 1763, it changed from French to English control. Then, in 1799, the name was changed to Prince Edward Island. 5 The people of P.E.I. were known for their independence. They wanted to be left alone to do things their way. They had a strong economy based on farming, fishing, shipbuilding, and the merchant trade. 6 In 1766, the land was divided by Captain Samuel Holland. The 67 lots he made were distributed to landowners in Britain. This was to cause a lot of trouble later, because the absentee landowners would not sell the land and charged high rents. 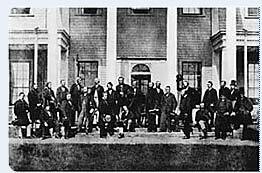 7 In 1864, the islanders held the Charlottetown Conference. It is interesting that the conference was held there since the P.E.I. delegates were against the union. Some think it was held there as a way to get the P.E.I. delegates to attend. 8 The reasons for their lack of interest were various. The main one was that some islanders thought they would lose control to their own government.